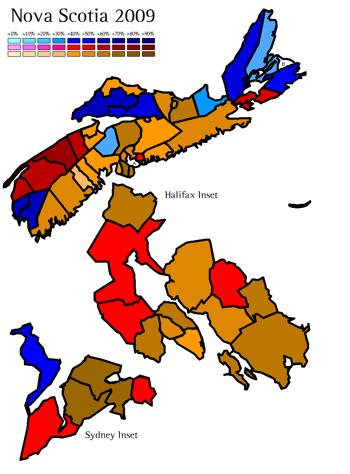 Amateur cartographer Gael L’Hermine, the remarkable Ottawa high school student who runs the World Elections website, has produced an intensity map of Tuesday’s Nova Scotia election. Click the image to get a larger version. The usual party colors (Tory blue; Liberal red; and NDP Orange) are shaded according to the winner’s percentage of the vote in each seat. Insets offer closeups of Metro Halifax and Industrial Cape Breton.